Experience Milwaukee the way it was meant to be seen-from our luxurious Milwaukee hotel. The newly-renovated Hyatt Regency Milwaukee hotel is located in the city's bustling downtown. Whether you're in town for a productive meeting, taking a visit to the Harley Davidson headquarters, or visiting family, our downtown Milwaukee hotel is your ideal resting place. Enjoy a relaxing evening in your spacious room, featuring plush Hyatt Grand Beds and deluxe Portico bath amenities, or unwind with a workout in our 24 hour StayFit gym. In town for a Meeting? 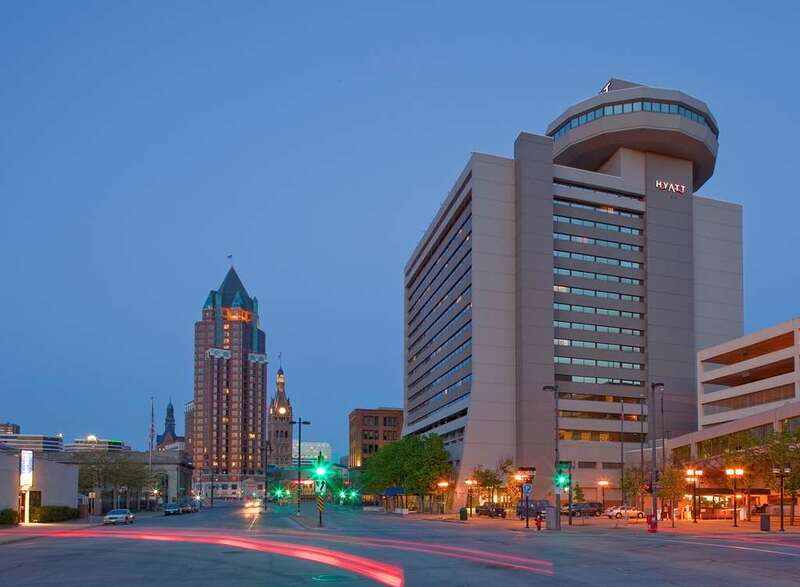 Our prime location places Hyatt Regency Milwaukee adjacent to the convention center. Don't worry about catching up on business calls either-in addition to Wi-Fi service throughout public areas, we offer a full-service business center to cater to all of your meeting needs. Whatever you're looking for, find it at Hyatt Regency Milwaukee. Bar 333: Cozy up to our Milwaukee bar and enjoy one of our many freshly prepared cocktails. Our liquid chefs have put together the most unique and varied drink menu in Milwaukee. In the heart of downtown Milwaukee, our hotel is connected by skywalk to the Frontier Airlines Center convention facility, Federal Plaza and Shops at Grand Avenue shopping center. Hyatt Regency Milwaukee is two blocks from the Bradley Center, Performing Arts Center and Entertainment District, and one block from the scenic Riverwalk.